Once the transplant evaluation visit has been completed, the required testing and other consults that were ordered or deemed necessary need to be completed. Frequently, this is the most time consuming segment of the evaluation process and where automation can be most useful. First, all the tests and visits must be scheduled. If the program does not facilitate the scheduling process considerable time can be added to the evaluation process. Having block time for common tests such as ultrasounds and cardiac echocardiograms can provide ease of scheduling and access and result in shorter evaluation times. Doing this often permits closer working relationships with the program's consultants which enhances the quality of the consults received and patient experience. During this time, the patient will also have any multi-disciplinary team assessments that were not completed during the evaluation as well as any other specialist consults that were identified during the initial visit. This segment of the transplant evaluation process generally produces the most challenges for data management across all phases of the transplant spectrum. First, the volume of data that needs to be processed can be overwhelming to staff who need to track it, review it and enter it into the database. Especially in the case of laboratory studies, multiple reports are often received, often with duplicated information. Compliance with regulatory issues, such as the requirement for two ABO determinations at distinct times, can also complicate data management. Having an automated solution that can accurately extract information from these reports and upload it into your transplant database and working reports can resolve numerous health data challenges, save considerable staff time and allow the staff to spend more time on clinical issues. When multiple radiology and other reports are received, these also need to be entered and have critical information extracted. Having a central location for all data, arranged in functional reports can significantly improve the workflow process of transplant coordinators, facilitating shorter work up times and, more importantly, ensuring compliance with regulatory requirements. Once the required testing is completed and results received, the patient is ready to be presented to the multi-disciplinary committee for consideration. It is important that all candidacy decisions are formally made in this venue to ensure regulatory compliance. During this discussion, you want ready accessibility to not only summary reports for ease of presentation but also to the primary source document should it become necessary to refer to it. This is particularly true for specialty areas such as cardiology where your cardiology consultant may want to review the details of a stress test for example to decide whether a cardiac catheterization is necessary. Such access improves the efficiency of your listing meeting. 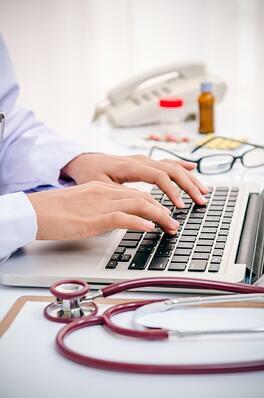 Once a decision on the candidate is reached, there must be documentation of it in the patient's medical record. When reviewing a program, auditors will seek this documentation. Finally, patients and their physicians must be notified in a timely manner following the listing committee's decision. Efficient data management will allow programs to reach work up goals of 90 days from evaluation to listing decision.